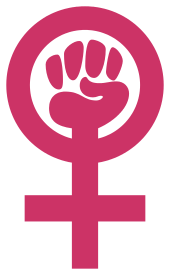 Individualist feminism, sometimes also grouped with libertarian feminism, is a term for feminist ideas which emphasize individualism. The Association of Libertarian Feminists, founded in 1973 by Tonie Nathan, the Libertarian Party's Vice Presidential nominee in 1972, is one of a number of different kinds of individualist feminist organizations. It takes a strong anti-government and pro-choice stand. Other libertarian feminist organizations include Mothers for Liberty, the Mother's Institute, and the Ladies of Liberty Alliance. ↑ McElroy, Wendy, ed. (2002). Liberty for Women: Freedom and Feminism in the 21st century. Ivan R. Dee, Publisher. ISBN 978-1-56663-435-9. ↑ McElroy, Wendy. "Individualist Feminism: The Lost Tradition". FEE. Retrieved 6 November 2014. 1 2 Siegel, Deborah, Sisterhood, Interrupted: From Radical Women to Grrls Gone Wild (N.Y.: Palgrave Macmillan, 1st ed. 2007 (ISBN 978-1-4039-8204-9)), p. 123 and see pp. 122–124 & nn. 32–34 (author Ph.D., writer & consultant on women's issues, & fellow, Woodhull Institute for Ethical Leadership). ↑ Archived August 28, 2009, at the Wayback Machine. ↑ Archived December 26, 2008, at the Wayback Machine. ↑ Archived December 25, 2008, at the Wayback Machine. ↑ McElroy, Wendy (2002). Liberty for Women: Freedom and Feminism in the 21st century. Ivan R. Dee, Publisher. p. 14. ISBN 978-1-56663-435-9. Libertarian Feminism: Can This Marriage Be Saved? Davies, S. (1987). Libertarian Feminism in Britain, 1860–1910. Libertarian Alliance Pamphlet, no. 7.